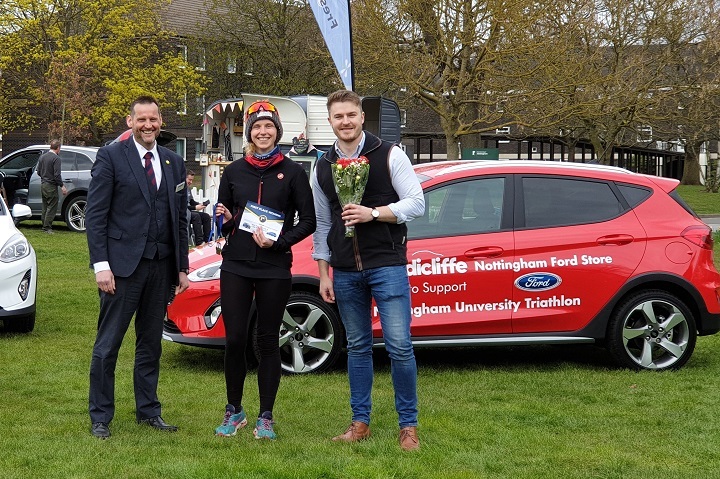 Sandicliffe Ford Notts Triathlon and TriStars Aquathlon return to the University of Nottingham campus once again. 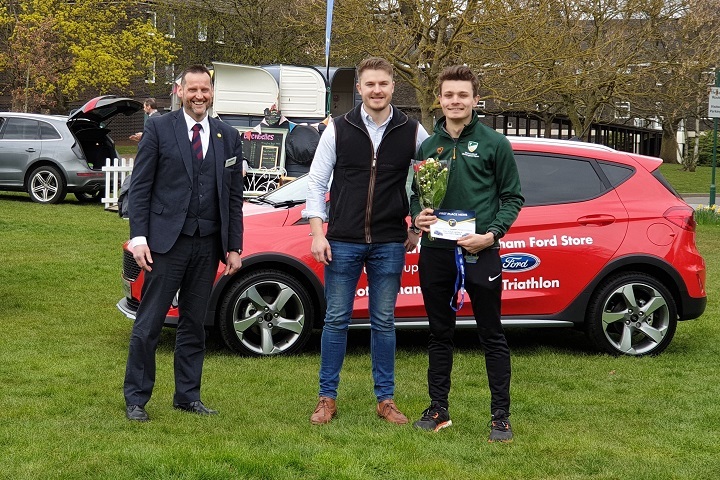 On Saturday 6th April 2019, Nottingham’s celebrated Sandicliffe Ford Notts Triathlon and TriStars Aquathlon returned to a dry, albeit cloudy, University of Nottingham campus. 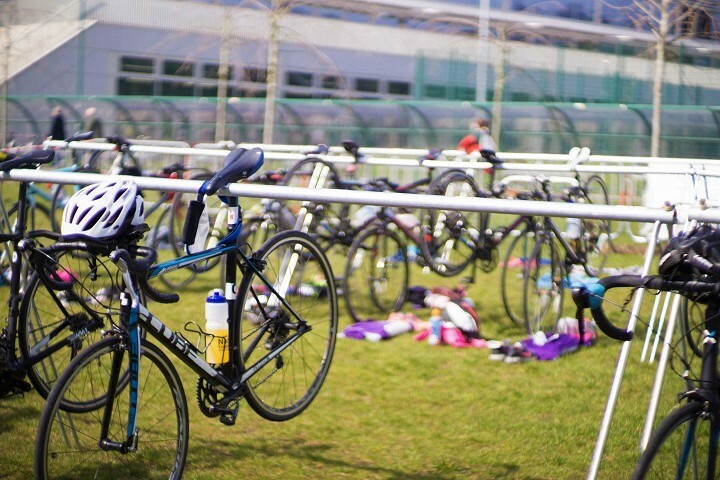 The award-winning event which takes place annually aims to encourage individuals of all abilities to compete in a multi-sport racing competition, whilst the TriStars Aquathlon is the youth equivalent for children aged 8 years and above. This year’s Triathlon sprint was comprised of three sequential events. 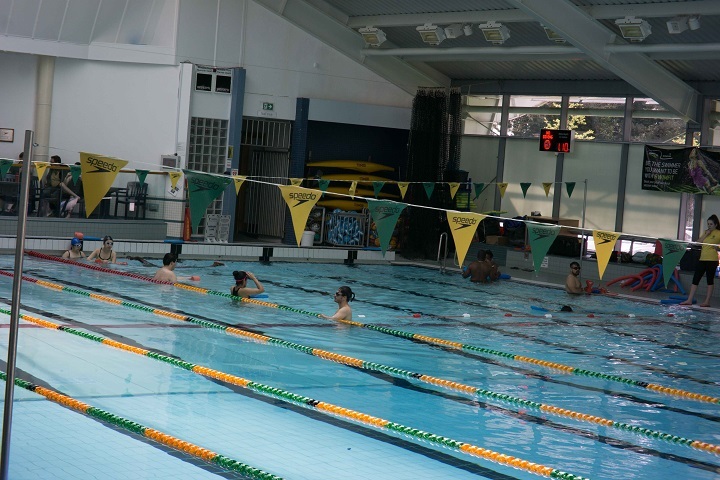 Contestants dived into their day with a 400m pool-based swim at University Park Swimming Pool followed by a hilly 5 lap 15km cycling loop around university campus private roads and ended in a traditional 5km marathon run around the beautiful campus and Highfield’s Park finishing in the Downs. Needless to say, the scenic route was taken! Out of the 155 participants, first place was stolen by racer number 108, Adam Thorpe with a fantastic finish time of 00:52:45! Adam raced through the 400m swim challenge in 6 minutes and 32 seconds, cycled around the university for 27 minutes and 34 seconds before he ended the day with a 5-lap run lasting only 16 minutes and 23 seconds. Well done Adam! Pictured left to right: Phil Lycett and Joshua Hunt of Sandicliffe with 1st place Notts Triathlon champion, Adam Thorpe. Adam was joined by Oliver George (Race No. 83) in second place with a finish time of 00:52:46 and Niall Rennie (Race No. 109) who placed third shortly after with a finish time of 00:53:15. In first place for the Women’s category was racer number 117, Emily Varley who finished with an overall time of 00:59:14. Emily swam the University Park Swimming Pool in just 6 minutes and 27 seconds followed by a 30 minute and 5 second cycle, ending with a 20 minute and 15 second run. Pictured left to right: Phil Lycett of Sandicliffe with 1st place in Women’s category, Emily Varley alongside Joshua Hunt of Sandicliffe. Emily was joined by Jessica Denman (Race No. 98) who achieved a finish time of 00:59:19 and Jess Robinson (Race No. 58) who finished with a time of 01:01:52. 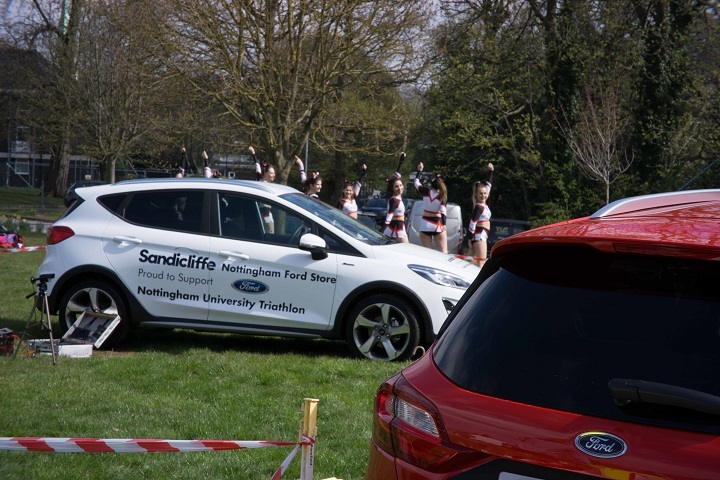 In recognition of our first-place titleholders, Sandicliffe Ford awarded our winners with the opportunity of a weekend driving around some of our prized possessions! That’s right, our winners drove off in either the Ford Fiesta Active or the Ford Kuga which they could enjoy for the whole weekend for free! 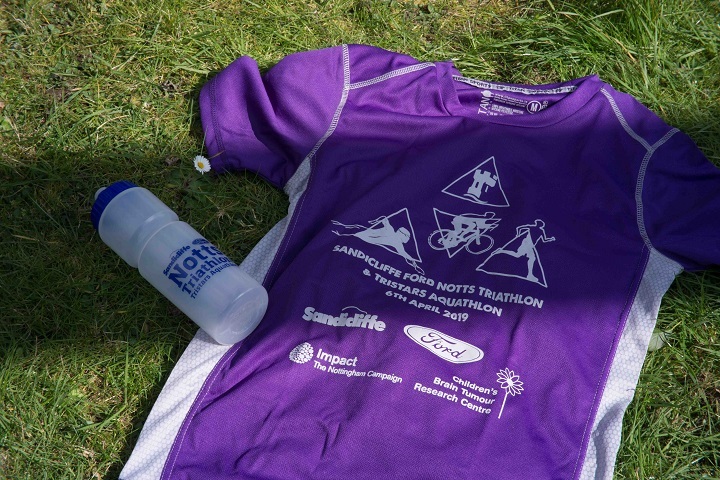 What does the Sandicliffe Ford Notts Triathlon mean to you? Putting something back into the community and encouraging kids into the sport, plus the opportunity to compete in such a stunning university campus. What goes through your head during the races? Usually “just get around the course and remember you’re 50”! Is there any advice you could give to candidates for next year’s event? Enjoy it, watch out for those hills and take in the views on the run. Pictured: Phil Lycett of Sandicliffe on his way to the finish line. 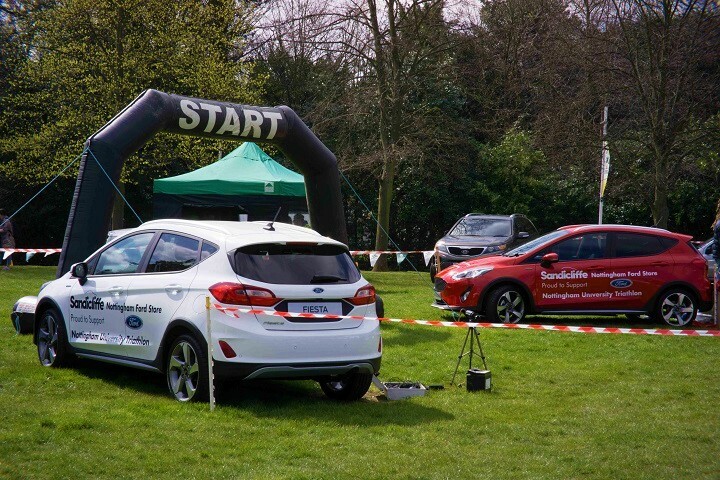 These were just some of the stories behind the scenes of the Sandicliffe Ford Notts Triathlon and we couldn’t have been more thrilled to have been a sponsor for the 4th year running. The event proves to be the perfect combination of our family values here at Sandicliffe as well as the family atmosphere created by the local community. A personal congratulations from everyone at Sandicliffe to all those who took part in the esteemed event along with a big nod in anticipation of what next year may bring.